Since I said I was going to try and only buy singles I have been doing such a good job of that and I'm pleased with the early year pick-ups so far. The one thing I hadn't thought of in this "great" plan was that if I don't buy any packs, blasters, or boxes, how will I trade for the cards I want? Yeah, so this plan will be easy until something new gets released. We all know once 2010 Series 1 comes out, I'll be the first one on daily Target checks. Anyway, while I am still behaving I took a trip to the Baseball Card Store to see Dave who was holding a nice Pujols for me. He also showed me a a video of Shaq challenging Pujols to a Homerun Derby. If you are interested in watching it, it's pretty amusing and the part when A.J., Albert's son is in the cage was my favorite. He has his Dad's swing down to a T. Look out MLB. There are a bunch of different segments but I'm pretty sure that is the one I liked best. Pretty damn sweet. 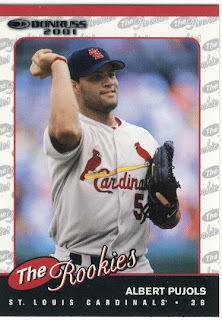 I also got an e-mail yesterday that there are more Pujols cards there for me to thumb through so hopefully I make it over there tomorrow or Monday. 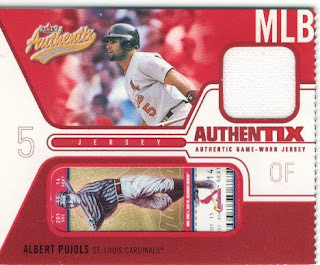 Anyone looking for game used jersey cards I have a ton to unload so if you are looking for a specific player to add a card or two to your collection let me know, chances are I may have one. IS he serious about $18,000? OMG. could have used that Guidry. Oh well, if you have any more or any Graig Nettles, I'd be interested. I've decided to re-start my Guidry and Nettles collections, since it appears I will only be collecting Topps flagship this year.